Everything about this summit is in the showy warm-up run. “I am on my way to Singapore,” tweets US President Donald J. Trump, “where we have a chance to achieve a truly wonderful result for North Korea and the World.” Such descriptions from America’s ever hustling television president tend to become child like, whether glowingly or indignantly. On this occasion, he was glowing. “It will be certainly an exciting day and I know that Kim Jong-un will work very hard to do something that has rarely been done before”. Holding the summit on Sentosa Island suggested a deliciously disturbing twist. Now a resort destination drawing some 20 million visitors a year dotted by theme parks, beaches and Singaporean state propaganda, it had been known as Pulau Belakang Mati, “island of death from behind.” During the Second World War, summary executions of members of the Singaporean Chinese population were common on the island, as were instances of brutality towards British and Australian servicemen after their surrender to the Japanese in 1942. This past did not distract. The two hefty figures approached before their flags. Pressed the flesh. Exchanged remarks. Before them stood two flags displayed with equal relevance (the free world types would have quaked), and a display that preceded an initial discussion between the two leaders. Importantly, that discussion was unencumbered by the machinery that has historically done as much to scupper smooth sailing than anything else. Only the two interpreters accompanying them at the initial stage will ever know. The horror that this television, social media tart of a figure might pull off a durable peace venture is not something that is missed by journalists and pundits. The press conference was filled with baffled queries: What about Kim’s appalling human rights record? What of the actual details, the sort usually left for the mechanists to worry about after the photo snaps are taken. For Trump, reminders were important, and praise directed when required: the Chairman “has before him an opportunity like no other to be remembered as the leader who ushered in a glorious new era of security and prosperity for his people. Then came that other horror: one of legitimacy. 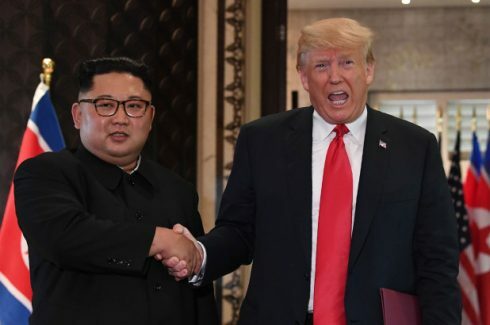 Both men, meeting alone, initially unencumbered by their advisors and policy staff; both, shaking hands and standing in front of their respective flags, levelling, legitimising, making those present complicit. This very fact would have made those familiar with the cultic regime padded by its ideological doctrine of Juche uncomfortable. It also showed the DPRK chairman that he had scored what was, some months ago, the unthinkable, and, more to the point, the unfathomable. A curious perversion was effectively at play. To have reached this point necessitated a nuclear program that effectively terrified and tormented US strategists with sufficient bite to take Kim seriously. To bargain it away in the absence of various onerous security guarantees supplies the greatest talking point of all. The White House mythology is to see different triggers: crippling sanctions, maximum, pig-headed pressure, the indignation of the “Little Rocket Man” school of rhetoric. Much of the previous work done to get the two leaders to Singapore was simply reiterated. The Panmunjom Declaration, signed by South Korea and the DPRK after the April 27 meeting committing both states to the complete denuclearisation of the Korean Peninsula, was reaffirmed. For one thing, both men insisted that what was signed did not necessarily incorporate what was said. Matters were tagged on, as if in a fit of absentmindedness. At stages during a press conference that resounded of Dada experimentation, Trump would tantalise journalists with remarks about record keeping – or its lack of. “We have notes or something,” he claimed offhandedly about the discussions. As ever, Twitter, with its brevity and short bursts of attention was a source to return to. “Great progress was made on the denuclearization of North Korea. Hostages are back home, will be getting the remains of our great heroes back to their families, no missiles shot, no research happening, sites closing”. The end, perhaps, of a certain beginning, done from behind. The confident younger man has plenty of it, but cuts it in a weird Western fashion…? …and here I was thinking that only women do that….worry about hair, I mean.. Behind all the television razzle-dazzle and hype, this agreement was a forgone conclusion and prearranged during previous diplomatic negotiations. Despite Trump’s bravado and tough talk, neither side was really going to walk away from the well-choreographed event. It was just a convenient photo-op and popularity boost for both sides. It put Trump in the perceived position of a tough negotiator and reinforced Kim’s local power by elevating him to a higher global position. Since the collapse of the 1994 Agreed Framework in 2006 and the labelling of North Korea as a member of The Axis of Evil, there was no scope for North Korea to be in any position to negotiate anything, especially the ending of the paranoia inducing decades-long South Korea/US War Games. The advancing North Korean nuclear capability simply put them in a position to negotiate. Trump is claiming sole credit but it was all down to diplomats behind the scenes – that’s how it really works. It’s a bit like the Cuban Missile Crisis where the USSR threatened to put nukes into Cuba in retaliation for US Missiles installed in Turkey. After the dramatic Hollywood stand-off where the USSR backed down, the USA quietly went about removing their Turkish Missile Bases.